American comedian Will Ferrell gives fans what they want in December with a return to his cult alter ego Ron Burgundy in “Anchorman 2: The Legend Continues” while Ben Stiller fulfils a long held dream to re-make “The Secret Life of Walter Mitty”. Ferrell’s films generate stronger box office returns in the US than they do around the world — “Anchorman: The Legend of Ron Burgundy” (Paramount Home Entertainment) made a total of $90.5 million in 2004 but $85 million of that was in the US domestic market. The former “Saturday Night Live” comic has fans in the UK and elsewhere, however, with hits such as 2003 Christmas comedy “Elf” (Entertainment in Video), which jollied up $220.5 million worldwide; 2006 motor racing satire “Talladega Nights: The Ballad of Ricky Bobby” (Sony Pictures Home Entertainment, which flagged $163 million; 2007 sports spoof “Blades of Glory” (PHE) which scored $146 million; and 2010 cops and robbers caper “The Other Guys” (PHE) with Mark Wahlberg, which took in $170.5 million. PHE has many of Ferrell’s comedies in box sets including “The Will Ferrell Collection”, which among other titles features the first “Anchorman” film plus “Anchorman: Wake Up Ron Burgundy” compiled from hours of extra footage, dropped sub-plots and alternate takes from the original. 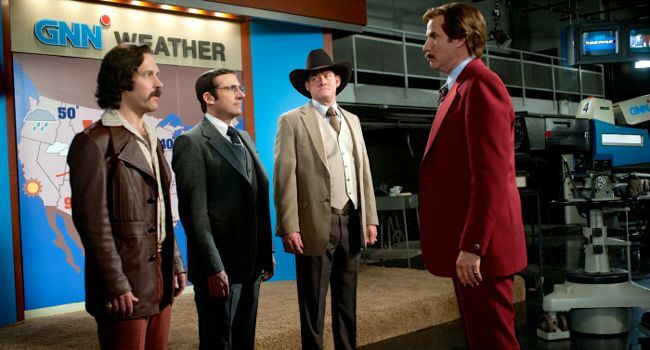 “Anchorman 2: The Legend Continues” (pictured below), which Paramount will release in the UK on Dec. 20, sees Ferrell’s guileless TV newsman move from San Diego to tackle the Big Apple. Adam McKay, director and co-writer (with Ferrell), and co-stars Christina Applegate, Paul Rudd, Steve Carell and Amy Poehler return. They are joined by Harrison Ford, Jim Carrey, Kristen Wiig, Liam Neeson, Nicole Kidman, Vince Vaughn, and Baron Cohen. Set in the 1980s, the film follows Burgundy as he adjusts to the then new phenomenon of 24-hour news. A lot of people get Ben Stiller and the blockbuster hits give him the freedom to direct his own pictures, including “The Secret Life of Walter Mitty”, due in the UK from 20th Century Fox on Dec. 27. It is based on a 1939 short story written by American humorist and cartoonist James Thurber about a man who escapes from his humdrum life in five daydreams in which he lives out acts of daring and heroism. The title character entered the language to describe a daydreamer with a fantasy secret life. Director Norman Z. McLeod in 1947 turned it into a vehicle for song-and-dance comedian Danny Kaye and Amazon’s Lovefilm says it is “coming soon”. McLeod was a veteran whose credits included “Horse Feathers” (1932) with the Marx Brothers, “Pennies From Heaven” (1936) with Bing Crosby, and “Topper” (1937) with Cary Grant and he went on to direct several Bob Hope pictures such as “My Favourite Spy” (1951), “Casanova’s Big Night” (1954), “The Paleface” (1948) and “Alias Jesse James” (1959). Danny Kaye had become a movie star by way of the Catskills clubs and Broadway and was well known for his ability to sing complicated lyrics very fast. He went on to make several very popular musical comedies including “Hans Christian Andersen” (1952) and “Merry Andrew” (1957), both available on Warner, and “White Christmas” (1954), “The Court Jester” and “The Five Pennies” all on Paramount. With his list of credits, Stiller can pick and choose projects. He’s had three giant franchises: Paramount’s “Fockers” series, which made $1.16 billion at the box office, and the “Madagascar” series, which earned $1.88 billion; plus a pair of “Night at the Museum” films from Fox that made $988 million in theatres worldwide with a third episode due in 2015. Other hits have included “Dodgeball: A True Underdog Story” (TCFHE), which had box office of $168 million, and “Megamind” (DreamWorks Home Entertainment), which grossed $322 million. TCHFE have a box set “The Ben Stiller Collection” with “Night at the Museum”, “Dodgeball”, and “There’s Something About Mary” and Paramount has a “Ben Stiller Collection” with “The Heartbreak Kid”, “Meet the Parents”, “Meet the Fockers” and “Zoolander” plus a triple pack of “Tropic Thunder”, “The Heartbreak Kid” and “Zoolander”. 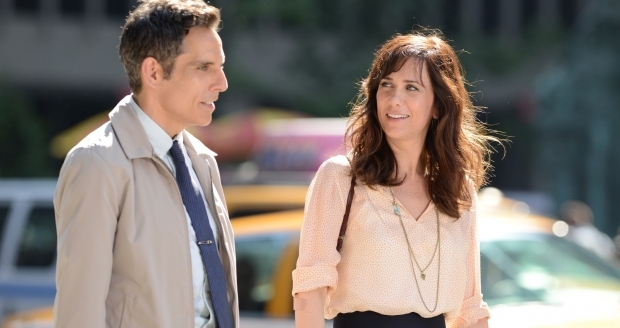 Kristen Wiig (pictured above with Stiller), Shirley MacLaine, Adam Scott, Kathryn Hahn, Patton Oswalt and Sean co-star in “Walter Mitty”, which Stiller directs from a screenplay by Steven Conrad (“The Weather Man”). This entry was posted in Film, News, Previews and tagged 'Anchorman 2: The Legend Continues;, 'The Secret Life of Walter Mitty', 20th Century Fox, Ben Stiller, Danny Kaye, James Thurber, Paramount Pictures, Will Ferrell. Bookmark the permalink.